Homeowners with large properties and commercial landscapers have enough work on their hands with lawn maintenance and landscaping. The last thing you want to spend time maintaining is more landscaping equipment. That's why Efco has created a commercial grade powerhead to reduce the maintenance required in being a professional landscaper. String trimming, hedge trimming, tree pruning, and leaf blowing with one commercial grade multi-purpose tool head. Simply powerful. Featuring a 21.7cc 2-stroke engine, the Efco split-boom multi-tool head produces robust torque while producing low levels of noise and maintaining fuel efficiency. The padded handles and ergonomic design and balance reduce fatigue during long periods of use, and make maneuvering in all directions much more fluid and natural. The recoil is designed for quicker starting and fewer rope pulls, and tools can quickly be changed out without additional tools. 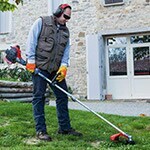 Ideal for cutting tall grasses and trimming crisp, clean edges, the Efco split-boom string trimmer fastens effortlessly into the Efco multi-tool head for commercial grade trimming projects. The total weight when combined with the head is only 12 pounds, making it easy to carry and maneuver for longer periods of time. It comes with a 4.3" Load & Go head, and accepts .095" trimming line. Just connect, and trim. Transition from trimming your lawn to trimming your bushes with the same engine. 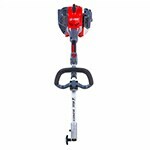 The Efco DS2400D hedge trimmer connects to the Efco split-boom head, and its 35" shaft enables the user to reach up to 9.8-feet high. 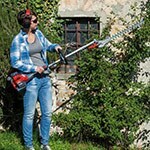 The hedge trimmer totals only 15.3 pounds when attached to the head, which means better handling and less exhaustion. There are also 12 adjustment positions, so you can angle the trimmer for smooth, straight cuts. Additionally, the blade is 19.7", allowing for easy maneuverability. Got some branches to trim? Need to shape some tree branches? Switch over to the Efco split-boom pruner and cut through branches and bushes up to 9.8-feet high. For awkward pruning jobs, the head has 5 adjustment positions ranging from zero degrees to 90 degrees. Including the power head, the entire tool weighs only 14 pounds and offers comfort and stability for longer use. 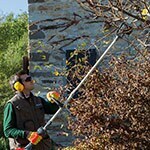 Once you're finished trimming and pruning, you can use the Efco leaf blower attachment to clean up the work area. It produces up to 134 mph worth of air speed and 353 cfm. Paired with the power head, it's only 12.4 pounds, so it's easy to maneuver without becoming tired. 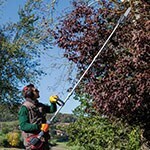 To reach 2-1/2 feet further while trimming hedges and trees, you can add the Efco split-boom extension attachment. It works with any of the tools, and adds only 1-1/2 pounds so you're not bogged down too much while working with it. Four Commercial Landscape Tools In One - Find out Featuring Efco Commercial Grade Split-Boom Power Head. Our string trimmer how-to library can help you pick the perfect electric string trimmer, gas string trimmer, walk behind string trimmer or brush cutter.